©2004-2019 F. Dörenberg, unless stated otherwise. All rights reserved worldwide. No part of this publication may be used without permission from the author. 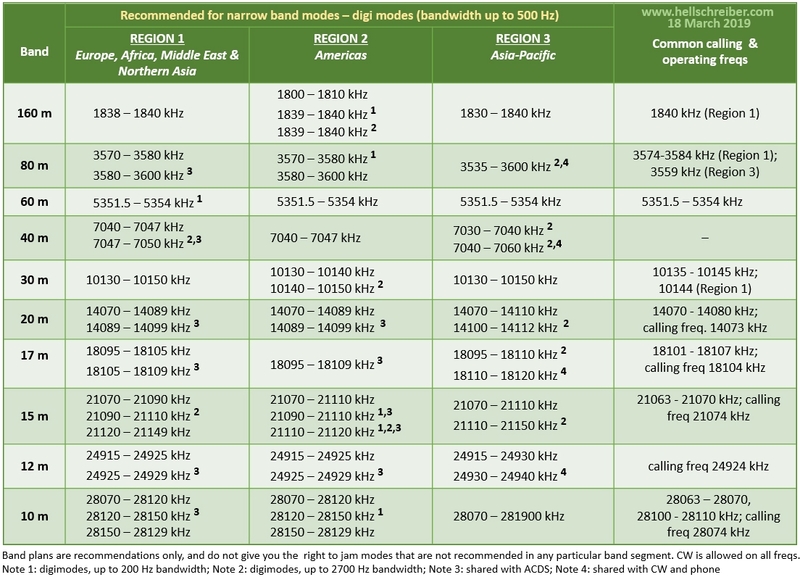 The following table shows the HF amateur radio band segments that are recommended for "narrow band" digital modes. That is, digital modes with a transmitted bandwidth of no more than 500 Hz. The standard Hellschreiber modes, in particular Feld-Hell, qualify as "narrow band digi mode" - but only if 1) you use original 1930s Hell fonts, and not any kind of modern font or lower-case, and 2) not over-modulate your transmitter! Always check the (voluntary) bandplan for the region and country that you are operating in! The table above is provided in good faith, without guarantees for being correct and up-to-date! You may also want to check the "Sked Request" page of the Feld Hell Club. The message board of the Feld Hell Club Yahoo Group is also regularly used/abused for skeds. Stations are primarily from The Netherlands, at least one with an original Feldfernschreiber machine (Arthur, PAØAOB); everyone is welcome! The net may be skipped some weekends in July/August, due to vacation of the primary operators (PAØAOB, PAØKDF, PA3FFZ, ON9BCD, F5GL). If you are beyond range on 80 meters, you can still listen live and print along, via a web-SDR in The Netherlands. This is what I do myself (I typically use this one), and when I'm SWL-ing, you can follow the QSO on my Hell-WebCam. On 6 December 2009, I finally (!) managed to participate in the Net, from my QTH in the south of France. My brief QSO with Bastiaan, PA3FFZ was my "first" Hell QSO on 80 mtrs and covered a respectable distance of 1084 km (675 miles). I used 80 watt and a temporary 2x13m inverted-L.
10 m: Mondays, 18:00 UTC, 28074 kHz; net lead: Larry, N3LFC; this net is not regular, due to the sunspot cycle. For the latest status of these nets, check the "Nets" page of the Feld Hell Club. Since 1977 (!) a group of Hell-enthusiasts gets together, primarily from The Netherlands and surrounding countries. This is referred to as the Annual Hell Meeting. I have been attending since 2008. The "Feld Hell Club" (FHC) was founded in 2006. I am member number 24. Membership (free, by the way) grew to nearly 5500 in the following ten years! The FHC offers Awards (Hell-DXCC, "Worked All...", etc. ), and organizes regular contests (see below). The FHC is also present on Facebook and Twitter. There is also a "FeldHellClub Groups.io" group (transferred there in May of 2018 from the "Feld Hell Club" Yahoo Group), and an inactive "Hellschreiber for Meteor Scatter" Yahoo Group. The world's first Hell contest took place in 1980 and was organized by the Deutsche Amateur Funkschreiber Gruppe (DAFG). Since 1981, this activity is organized by the German Amateur Radio Club (DARC, Deutsche Amateur-Radio-Club e.V.). The official contest rules are here (in German). The 1981 contest results are here. The Feld-Hell Club organizes a contests each month! Their contest calendar is listed here. On December 30/31, 2006, I participated for the first time ever in a contest - Hellschreiber, of course! I did OK: came in 12th out of 79 participants. Worked 68 stations in 26 countries on 3 continents. "Hell" contests are fun, no stress like contests of all other modes, and are short (no more than a couple of hours). Go for it!